Defence Minister Manohar Parrikar on Thursday formally handed over the indigenously-built heavyweight anti-submarine torpedo Varunastra to the Indian Navy. With this, India has joined the list of eight countries having the capability to design and build such a system. * Having almost 95 per cent indigenous content, Varunastra, costing about Rs 10-12 crore per unit, is capable of targeting quiet and stealthy submarines, both in deep and littoral waters in intense counter-measure environment. * Varunastra weighs around 1.25 tonnes and can carry about 250 kg of explosives at a speed of around 40 nautical miles an hour. * They have conformal array transducer which can look at wider angles than other torpedos. * Varunastra has been designed with latest technologies such as high-speed and long endurance propulsion, software driven intelligence, conformal array acoustic homing with wide look angle and advanced digital signal processing. * It is also having advanced autonomous guidance algorithms with low drift navigational aids, insensitive warhead which can operate in various combat scenarios. * Varunastra exercise variant has integrated instrumentation system for recording all the dynamic parameters of the weapon, redundancy in recovery aids in case of emergency shut down or malfunction. * It has a GPS-based locating aid, a unique feature in contemporary torpedoes in the world. * 'Varunastra' was extensively tested at sea in association with Indian Navy for evaluating the weapon capabilities as per Naval Staff qualitative requirements. The weapon has completed all environmental qualification tests like shock, vibration, temperature cycling, marine environmental tests. 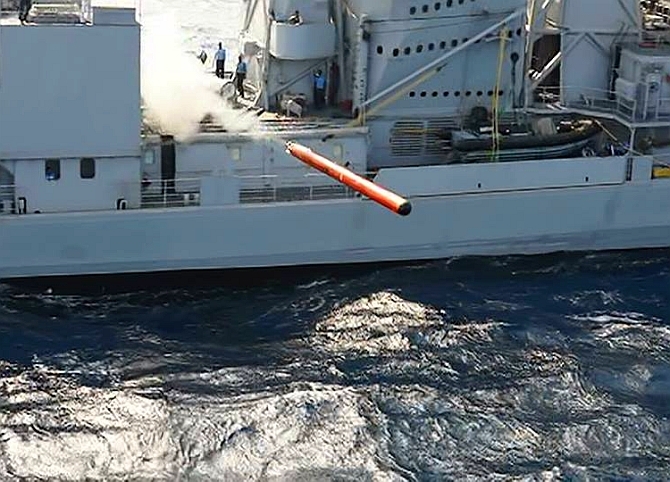 * Varunastra can be fired from the Rajput class destroyers, Delhi class and all future Anti-Submarine Warfare ships capable of firing heavy weight torpedoes and is capable of targeting quiet and stealthy submarines both in deep and littoral waters even in intense countermeasure atmosphere.